I’ve been on a yarn wrapping kick that has no indications of letting up anytime soon. And it’s coming in handy for the holiday season. I’m having somewhat of a recycled Christmas. I’ve wrapped a few presents so far in newspaper and embellished them with Duck Tape. 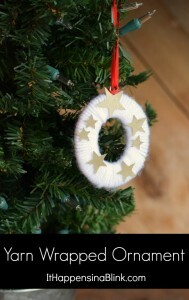 And I spruced up an outdated ornament with yarn last week. Lately, I’ve been saving mandarin orange cans. My kids adore mandarin oranges. Personally, I can’t bear the smell or taste of them, but the kids love them so I keep buying them. We buy the larger size can, and I’ve been saving them for weeks because I think they will be perfect for gifting small treats. 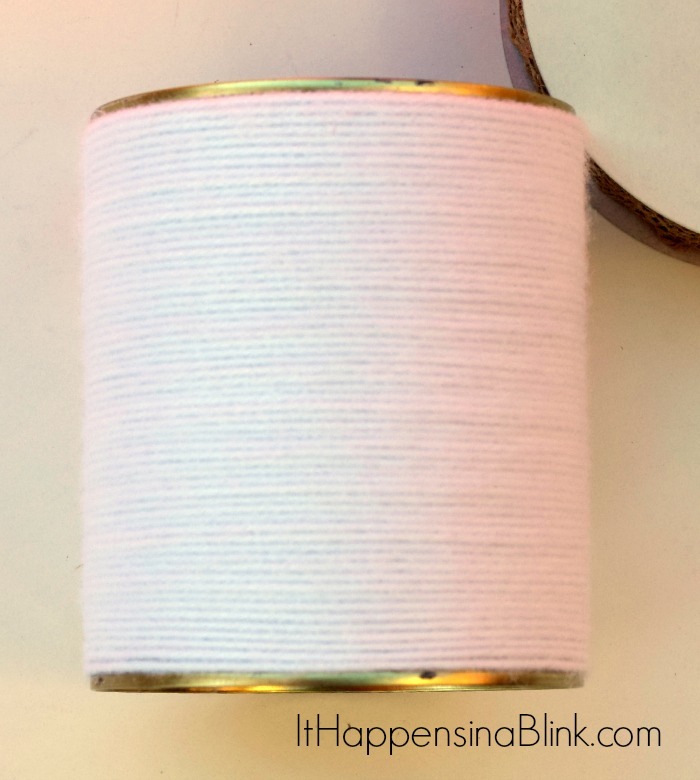 I’ll be sharing different ways that I’m decorating them over the next month or so, but today I’m…..Yarn Wrapping it! 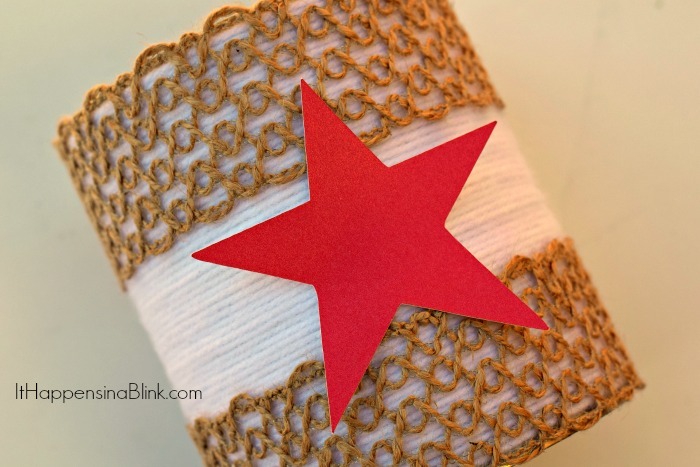 Here’s an easy Yarn Wrapped Tin tutorial that puts yarn scraps to good use. 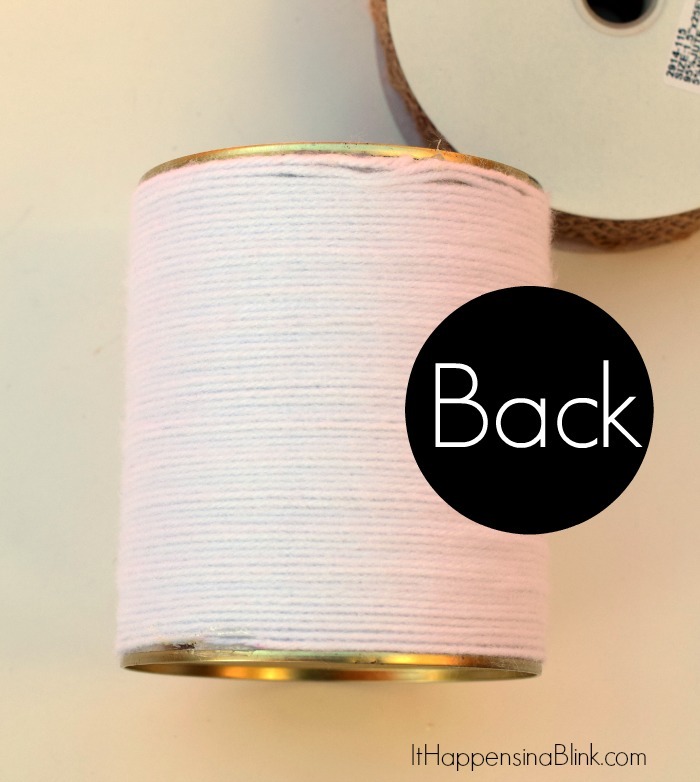 Wrap the yarn around the tin can, securing at the beginning and end with hot glue. I placed a few dots of hot glue along the way, but if the yarn is wrapped tight enough you will not need a lot of hot glue. There will be a discrepancy where the hot glue begins and ends, but we will be covering this up with the ribbon. 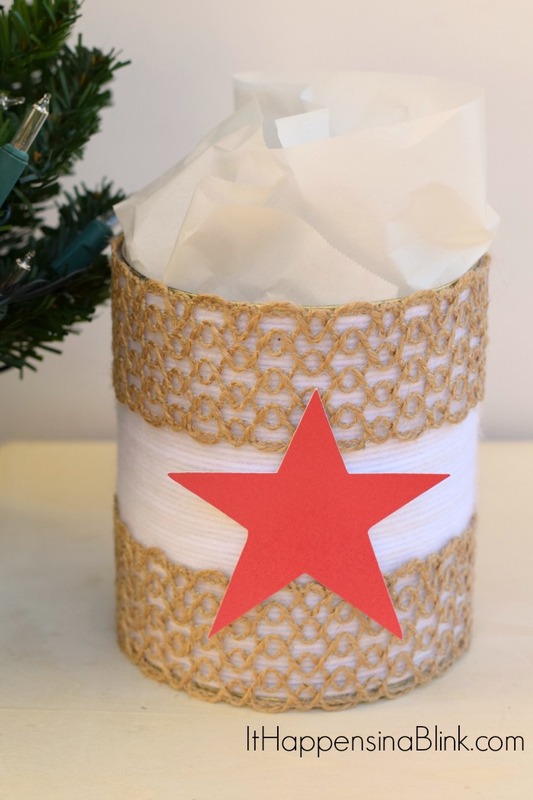 Cut two lengths of jute ribbon and hot glue them in place at the top and bottom of the can. 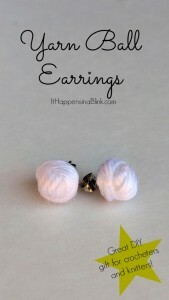 Utilize them to cover up any imperfections in the yarn wrapping. Embellish the can as desired. I used my Cricut Plantin Schoolbook cartridge to cut out a simple star from red, sparkly card stock. I used the hot glue to secure it in place. Insert treats in the can wrapped in treat bags or parchment paper. 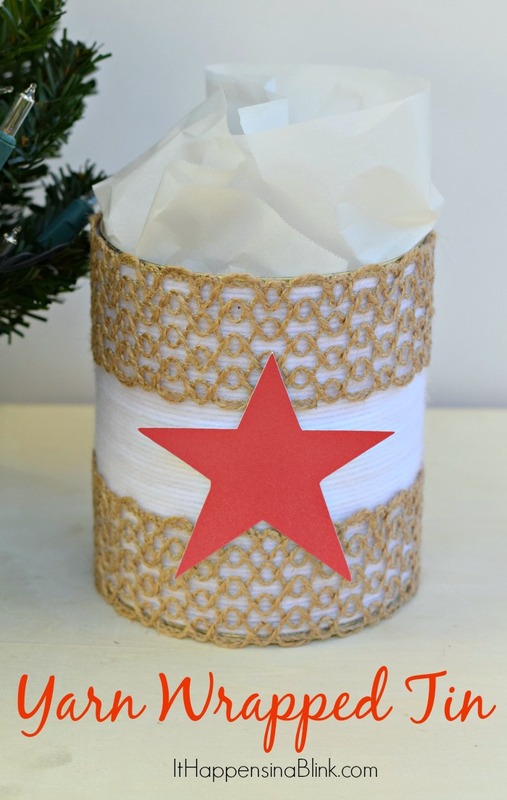 You can also place small gifts inside or use them for decorating. 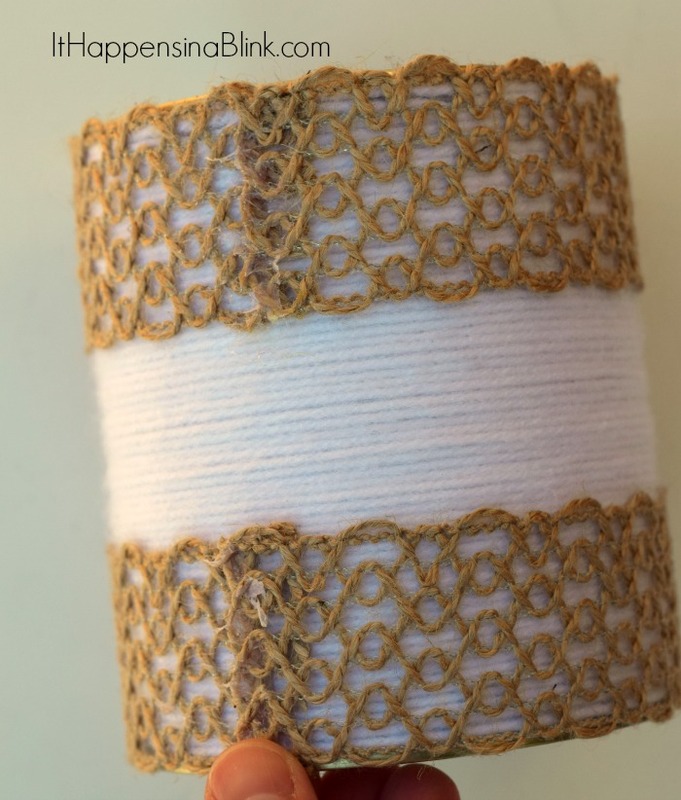 Want more yarn wrapping projects? Check out some of these! Love this idea! Pinned for all my cans I need to use. Thanks for sharing! 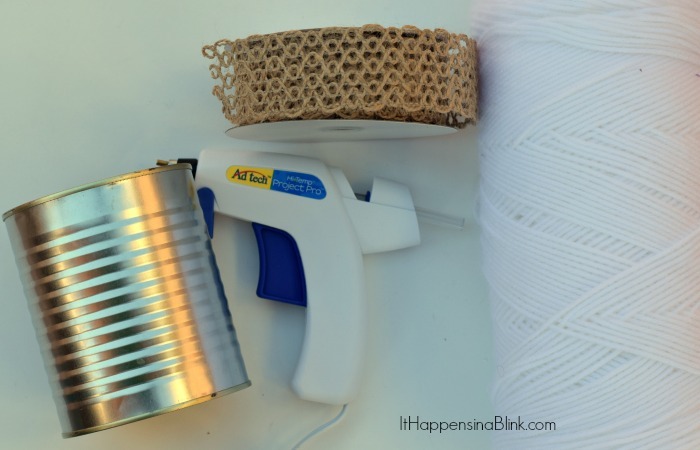 Wrapping the can with yarn first is BRILLIANT! I LOVE how this turned out!